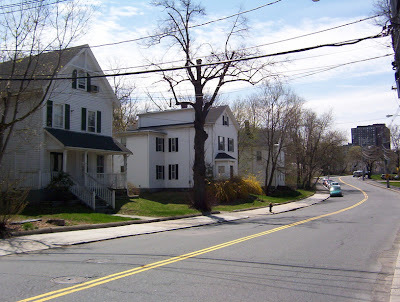 This is a weblog related to community activities going on in Brighton, MA, one of the neighborhoods of Boston. Ours is a large and diverse community including many long-term residents, recent immigrants, and students attending the local universities. The Boston Globe published two letters-to-the-editor in response to their editorial earlier in the week that questioned the merit of part of Boston College's master plan related to undergraduate housing. Pilar Landon, editor-in-chief of BC's student newspaper, The Heights, writes that "it is unfair to ignore the many academic, extracurricular, and athletic achievements of students and to discount them with these sweeping generalizations," such as "a well-earned reputation for hard drinking and loud partying." Eva Webster of the Chestnut Hill Reservoir Coalition stated that the Globe editorial missed pointing out BC's poor choice in locating some dorms directly across the street from the reservoir. "If some other school wanted to build undergraduate dormitories on the edge of Jamaica Pond, would anyone be surprised by public opposition to that?" At Wednesday's meeting of the Boston School Committee, they approved a name change for Allston's Thomas Gardner Extended Services School. The school is now named the Gardner Pilot Academy. The school completed its transition to a pilot school earlier this year. The current Boston Teachers Union contract allows for an additional seven Boston Public Schools to become pilot schools. Boston Foundation President Paul Grogan thinks that there has been a four-year delay in pushing for new pilot schools, and threatened to send some money to state-chartered schools -- unless Boston keeps pushing for more pilot schools -- according to the Boston Globe. The hang-up? Despite the fact that pilot school teachers remain in their collective bargaining unit, keep the same pay and benefits, and continue to accrue seniority just as they would in a standard BPS school, the BTU appears to be fighting against new pilot schools. The Globe writes that "while voicing its support for the schools, the teachers union has continued to push for a variation that would allow educators to retain their union rights." Those rights have to do with hours and workplace conditions, not pay. New School Superintendent Carol Johnson seems to be renewing the push for more pilot schools by setting up an informational session at the BTU offices on January 4. This evening around 10 pm, Market Street southbound had some cars travelling on it. Maybe this means that it will remain open in the morning. The MBTA is no longer showing service advisories for bus #86. Hopefully, Wednesday morning we won't have gridlock for a six-block radius around Brighton Center like we've had Monday and Tuesday. At one point on Tuesday morning, one detour route, southbound Foster Street, was literally backed up bumper-to-bumper all the way from Commonwealth Avenue to Washington Street. The massive traffic jams and gridlock experienced in the Brighton Center area these last two days is one indication of how the transportation infrastructure around here has been stretched to its limit. One little road closure (southbound for two blocks of Market Street) has caused a ripple effect on the traffic patterns all around the neighborhood up to a mile away. Time to bring back those streetcars to discourage people from driving on Washington Street. Earlier: Brighton Rite-Aid (nee Brooks) Pharmacy roof collapses. Southbound Market Street remained closed until completion of work to shore up walls from further collapse. Do BC Students Behave Well in Off-Campus, Large Apartment Buildings? Father William Leahy, S. J., President of Boston College, recently told Boston Herald reporters and editors in a meeting that "larger apartment buildings which also host numbers of BC students rarely encounter the same kind of problems" as found in 1- or 2-family houses occupied by students. For those unclear what those "problems" are, according to the Herald, Fr. Leahy said they are the "ones with absentee landlords and no one to ride herd over student behavior or those weekend parties." The Boston Globe editorial board is more direct: "The students have a well-earned reputation for hard drinking and loud partying." Do BC students in large, off-campus apartment buildings really behave so much better than those off-campus students in 1- and 2-family houses, as Fr. Leahy claims? In a meeting earlier this year, a BC official stated that around 40% of the residents of the apartment tower at 2000 Commonwealth Avenue in Brighton are BC undergraduate students. Sounds like a good test case for the "Leahy Hypothesis" -- that the students would be comparatively well-behaved in a tall, off-campus building. A quick trip to "apartmentratings.com" produces 20 resident-supplied ratings for the apartment complex, only 20% of which would recommend the apartments to someone wanting to rent. Out of all the apartments listed when entering zipcode "02135" and having more than one review, 2000 Commonwealth Avenue comes out in last place in the user-ratings. "Noisy and worse...": Almost any night of the week parties can spill into the halls. It is literaly threating to have such drunkin people wandering loudly around the building. "I wasted $54,000 over the last 2 years": But over the last year and a half management seems to have lost control. I now paying top dollar to live in the "ANIMAL HOUSE". If you like to party all night and don't plan on sleeping for your entire stay here then move on in. Otherwise, stay away. I'm "OUT OF HERE ASAP"!!! "It is a dorm! ": Now for the negative, it is a dorm! Most of the building is BC students that love to party and don't care a whole lot if they blast thier bass all night long! Keg parties, beers in the elevator, students running up and down the hallway, breaking things. Trash left in halls, puke in the elevator. "Stay Away from This 'Luxury' Dorm!!! ": This is a real DORM for spoiled boston college kids... If you are older than 21 and have a job - STAY AWAY from this place. IT IS NIGHTMARE!!! All that bs below about "couple bad apples" is simply NOT true. Come and see by yourself after 10pm on Friday or Saturday. "Noisy Dorm": The sole problem (and it's a BIG problem) is with some of the BC students. The few bad apples made living in the building unbearable. They had loud parties to all hours of the night, left garbage where ever they felt like it and generally had no respect for their neighbors. Most of the BC students were not like that, but because such a huge portion of the residents are BC students, the small percentage of "bad apples" made up a fairly sizable group. "Stay Away... Really": I also warn parents that are considering a lease for their precious indulged babies that this is a building infested with unruly parties. I wish could show a video of the drunken idiots in the halls. "BAD": Biggest mistake of my life. I am going to have to break my lease...late night parties..vomit on floors...beer cans on elevator floors...just a few of the problems...not LIKE a dorm...WORSE than a dorm..
"Pool and Parking!!!! And an ATM...": Any time there has ever been a noise complaint (and maybe I've only had 2...same as any other building I've ever lived in) the 24 hour concierge responds immediately and the noise stops within 5 minutes. though "Pool and Parking" seems to be drowned out by all the spilled beer in the other reports of hard partying. I think the evidence is sufficient to reject the Leahy Hypothesis. I am convinced: I'll never move there. Maybe Fr. Leahy ought to spend some quality time with his charges at 2000 Commonwealth Avenue before making such claims. And the editorial board of the Boston Herald might think about fact-checking their interviewee's claims prior to publication. Why Would Fr. Leahy Make Such a Claim? Why would a prominent BC official be making a claim that seems, in retrospect, at least a bit divorced from reality? As part of their institutional master plan, BC has proposed to house an additional 610 undergraduate students on-campus -- but leave another 600 or so undergraduate students still living off-campus. Something still needs to be done about those other 600 off-campus, partying students. Here's an even more cynical idea: BC thinks that all they have to do is move the students out of the particular neighborhoods with the most complainers. At Brighton community meeting after community meeting, the complaining neighbors are typically from the Radnor Road area (including upper Foster Street, Lane Park, and Kirkland Road) or the Lake Street area (including Undine Road and Caltha Road). I've looked at many lists of attendees, and they just don't come from 2000 Commonwealth Avenue. The meeting attendees come from the streets listed above -- themselves living in 1- and 2-family houses, mostly not big apartment buildings. 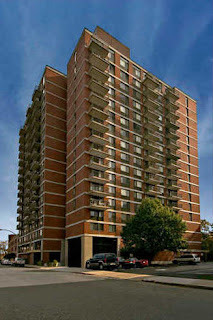 Why don't community attendees come from such large apartment buildings? Non-student renters in such buildings are typically, albeit not exclusively, residents who are more "transient," i.e., they often move every year or two. They may live in Brighton this year, but last year they were in Allston, and two years from now they might be in Jamaica Plain. Such renters are, on average, younger, may not know much about the neighborhood, be less likely to know who to complain to (at the city, police, or BC), be unclear on what their rights are regarding noise disturbances, etc. They could potentially also fear retribution from residents in the same building. It's a common issue probably faced by many communities: community activists tend to be of a certain age. Twenty-somethings just aren't a regular part of community meetings, even though they constitute such a large fraction of our neighborhood's residents. In the end, BC's proposal for restricting students' off-campus options sure looks to be pitting one part of the neighborhood (residents who live in 1- or 2-family houses) against another (residents who live in larger apartment buildings). We'll see if the neighborhood takes the bait. I bet they don't. In the most bizarre aspect of this story, BC officials have been presenting the case for the on-campus housing in their master plan using the opposite argument. Time after time, the community has been told that on-campus BC students behave worse in tall dormitories, but better in housing with four stories (or fewer). BC officials insist on not increasing the height of the undergraduate dormitories on their Main Campus using this argument despite plea after plea from the neighbors. Why would these students behave poorly in a tall, on-campus dorm -- but magically behave better in a tall, off-campus apartment building? As described above, at least one tall, off-campus apartment -- without resident advisors, BC police, or patrolling campus officials -- seems to be quite a problem, so claiming otherwise is just a sleight-of-hand. But put the same building on campus, add back in the resident advisors, police, and officials, institute an alcohol policy, and... voila! Common sense dictates that it could only be better on-campus, not worse. But, then again, why would we want to listen to common sense? Contrary to the Allston-Brighton TAB's blog post, Market Street is not fully open to traffic. As I noted this morning, only northbound traffic is currently allowed on Market Street; southbound traffic is still, as of 4 pm, being detoured east-west on Arlington Street. There is an electronic sign at Market Street and Faneuil Street announcing a detour via Faneuil Street and Parsons Street. Virtually no cars seem to be following that detour, causing a big slowdown on southbound Market Street approaching St. Columbkille's church. Follow the signs! Southbound MBTA #86 buses are turning left (east) at Arlington Street, and then (presumably) right onto Cambridge Street followed by left onto Chestnut Hill Avenue. I saw one #86 bus southbound across from the Veronica Smith Senior Center, so they appear to be turning left from Washington Street onto Chestnut Hill Avenue. Needless to say, traffic within 4-6 blocks of Brighton Center is awful in virtually every direction. Take alternate routes. Steve MacDonald, Public Information Officer for the Boston Fire Department, confirmed that no people in nearby buildings have been evacuated as a result of the partial building collapse of the Rite-Aid Pharmacy. I saw construction workers off-loading large concrete blocks from a flatbed truck at the site. MacDonald said that these blocks will be used as part of shoring up the exterior walls of the building. That work is going on tonight, and may continue throughout the day tomorrow (Tuesday). Once the exterior walls are supported, MacDonal said that full vehicular traffic can then resume on Market Street. Traffic was being kept some distance away from the building because of the nature of the buckling of the walls and roof. If they north or south walls caved inwards, according to MacDonald, then the eastern wall facing Market Street could cave outwards -- spraying glass and bricks onto the sidewalk and part of the street itself. Continued assessment of the structural integrity of the building will be made by inspectors from Boston's Inspectional Services Department and the property owner. Boston Police will continue to in charge of the traffic management around the area. I saw WHDH-TV (channel 7) and WCVB-TV (channel 5) trucks near to the Rite-Aid store at 4 pm, so they are probably planning on live-on-the-scene reports tonight. WBZ has now updated today's story with the correct address. Hopefully they told their team in the field. Bus 64 Oak Square - Kendall/MIT - is being diverted due to roadway problem - snow route. Bus 86 Sullivan Sq. Sta. - Reservoir (Cleveland Circle) - is being diverted due to Street closure. 2 stops missed. Market @ Arlington and Keenan. UPDATE (10:00 am): Market Street northbound is now open. Southbound is being diverted to side streets. The problem with the alternate southbound route(s) is that they mostly lead to uncontrolled intersections, i.e., without traffic signals. There are a number of BPD officers around trying to direct traffic, but Washington Street in both directions, and Market Street southbound, were nearly in gridlock this morning. MBTA Bus #86 is making all stops northbound, but the two stops mentioned above are likely being missed for southbound buses. But BC does not make a convincing case why the shift can’t occur on its existing campus south of Comm. Ave. The master plan calls for the construction of at least two new, four- or five-story dorms on that end of the campus. Adding a few more stories to those buildings and maximizing the use of land now occupied by outmoded modular housing units could lessen or even eliminate the need for student housing on the new Brighton part of the campus. That is exactly what the neighborhood and elected officials have been saying to BC officials all year. The Globe has clearly been listening to the neighborhood, as is obvious from the reporting in their news stories (such as here and here) where they solicit comment from Brighton residents. Will BC listen to the neighborhood, too? Or will they continue with their, according to the Globe, "stiff-necked approach"? College officials should be willing to adjust their ambitious vision if they hope to win local support and city approval for their plan. As a reminder, there will be a meeting of the BC Neighbors Forum tonight at 7:00 pm in order to solicit neighborhood response to BC's master plan. This is the fourth meeting by the group. Everyone will receive the opportunity to speak, as time permits. Part of the roof of the (Brooks) Rite-Aid Pharmacy at 399 Market Street (in Brighton) collapsed this evening under the weight of all the wet snow. WBZ-TV erroneously reports it occurring at the 181 Brighton Avenue location in Allston, while Boston Police report it occurring at the Market Street location in Brighton. The officer answering at D-14 station confirmed it was the Market Street location. WCVB-TV has the correct location. The sole customer in the store was injured and taken to St. Elizabeth's Medical Center. The four employees present in the store at the time presumably were not injured. The roof and walls of the building appear in danger of further collapse. The Boston Police are shutting down the street in front of the 399 Market Street store tonight and through tomorrow morning. They advise travellers Monday morning to avoid that part of Market Street (one block north of Brighton Center) for their commute. No word on how the MBTA bus #86 will be re-routed tomorrow, because it travels along Market Street at this location. Brighton residents are invited to attend a community meeting to analyze and discuss the details of the Boston College institutional master plan. The meeting will take place on Monday, December 17th, 7:00 pm, at the Brighton Elks Lodge, 326 Washington Street, Brighton Center. The Boston College Neighbors Forum is an unaffiliated, independent grassroots discussion group. The goal of the meeting is to build a consensus in the community on issues of common concern, and to prepare formal community feedback to BC and the City of Boston. Public participation is strongly encouraged and all residents will be afforded an opportunity to speak as time permits. Possible topics for future meetings will be discussed. For more information, contact Michael Pahre at 617-216-1447 or pahre@comcast.net; or visit the BC_Neighbors_Forum Google Group. Parking is available at the rear of the building, accessed from Winship Street. 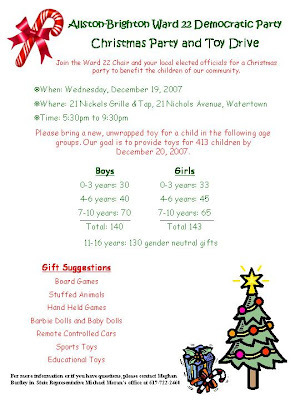 A PDF flyer can be found here. BC's institutional master plan notification form can be found at the VHB website. More information, and links to media reports, can be found on a previous post. The master plan filed by BC differs a bit from previous versions they presented earlier this year. Earlier media coverage of BC's housing plan in the Boston Globe can be found here, followed by letters-to-the-editor, as well as an editorial. The BC Neighbors Forum held three public meetings earlier this year (here, here, and here). Media coverage of previous events can be found here and here, and an op-ed column I wrote about the May meeting of the BC Task Force. The City of Boston encourages businesses to release employees early. Rush hour is expected to see the storm’s heaviest snowfall. Everyone is encouraged to use public transportation. All City of Boston afternoon and evening activities will be cancelled. Do not park cars within 20 feet of an intersection. Parking too close to an intersection can restrict emergency vehicle access. Do not throw snow back into the street. “Throwbacks” force the city to remove snow from the same street twice. Shovel out fire hydrants close to your home. Property owners are reminded to shovel snow from sidewalks that abut homes and businesses. Check on elderly and neighbors and others in need. During declared snow emergencies, discounted parking is available at several parking lots and garages to cars that display Boston resident parking stickers. A list of locations is available at www.cityofboston.gov/snow. The city’s Know Snow program will be in effect this afternoon to alert residents of the snow emergency. The City of Boston Storm Center will open at 2:00 p.m., when the snow emergency goes into effect. Residents with storm-related questions or concerns should call the center at (617) 635-3050, starting at 2:00 p.m.
UPDATE: The citywide snow emergency and parking ban will remain in effect until 6:00 a.m. Friday morning. UPDATE: Boston Public Schools will be closed on Friday. Boston Globe columnist Derrick Jackson published his annual "Graduation Gap Bowl," which is a comparison of the graduation rates of the college football teams who will be playing in post-season bowl games. In past years, the general trend is that the top-ranked football teams have lower graduation rates, but this is not a hard-and-fast-rule. Jackson also inspects the gap between white and black football players at each school. Last year's compilation by Jackson had an unusual situation: #1 Navy (98%) was facing off against #2 BC (96%) in real-life bowl game. (BC won.) This year? Same ranking: #1 Navy (95%) and #2 BC (93%), although they won't be facing each other in a bowl game. There is an important caveat to this: Jackson reports only the graduation success rates (GSR) of football teams going to post-season bowls, not all Division-1 football teams. I have not inspected the large number of other football teams that didn't make it to a post-season bowl game; a cursory inspection of a few schools found at least one that was as high as BC: Stanford University (GSR 93%). Harvard University has no tabulated GSR because GSR is only calculated for students on athletic scholarships (Harvard offers no athletic scholarships), so there may very well be other universities with higher graduation rates among student-athletes who aren't on athletic scholarships. The student graduation rates can be found at the NCAA website, along with an explanation of the numbers. Here are BC's historical numbers. Year 2007 refers to students who graduated by August 2006; these are combined numbers for 4-year graduation rates (i.e., those who entered in fall 2002) and 6-year graduate rates (i.e., those who entered in fall 2000). The method of calculation preferred by Jackson changed in 2005 following changes in how the NCAA reported the numbers. Since 2005, Jackson's tabulated numbers have been an overall GSR, which accounts for students who graduated within four years, and those who entered two years earlier and graduated within six years. (The GSR also accounts for transferring students.) Before 2005, the NCAA did not reported combined numbers, only reporting separately the 4-year and 6-year rates; Jackson used the 4-year rates before 2005 in his columns. The numbers show clearly that BC has significantly increased its graduation success rate for the last two years of graduating classes over the previous six years of graduating classes. Nationally, the trend is also upwards (see p.3) for football players for similar years, but not nearly as large a jump as seen at BC. Why did BC see a significant increase in their football student graduation rate reported after 2005, i.e., for the students entering after 2001 for 4-year graduation by August 2005 (and are then reported by the NCAA in 2006)? Did BC introduce a particular, new academic program for student-athletes on-campus after 2001? Did BC tighten their entrance requirements in 2001? Did BC loosen their graduation requirements in 2005? Did BC enforce academic achievement requirements for student-athletes more vigorously on campus after 2001? According to Reid Oslin in BC's Public Affairs office, "there have been no changes in student-athlete admission policy, graduation policy or academic achievement policy in recent years." Instead, Oslin points to the "continuity of the staff in BC’s Learning Resources for Student-Athletes’ office," which has been headed by Dr. Ferna Phillips since 1999 -- around the time that the student-athletes showing the recent gains in graduation rates began matriculating at BC. Phillips has close contact with faculty who teach classes with student-athletes, according to Oslin, thereby proactively heading off academic issues before they become too serious. The not-quite-so-good news about BC's student-athlete graduation rates? Student-athletes at BC graduate at a slightly lower rate (4-year SGR of 85%) than BC's student body in general (90%). Football players (87%) do a little better than other student athletes on average, though this is probably not statistically significant because it is likely a difference caused of only around one additional football player who graduated. BC's trend for lower student-athlete graduation rates than the rest of the student body is contrary to the nation-wide trend, where both white male and black male student-athletes nationally graduate at higher rates than their non-athlete peers at the same institution. A Boston Globe story on Harvard's Allston planning has led to a charge, by Harvard's President, of mispresentation. In the end, however, it appears as though Faust is the only one who has committed any misrepresentation. The president of Harvard University, Drew Faust, showing restraint on a major expansion that her predecessor relentlessly promoted, plans to reexamine proposals to move two graduate schools and other operations from Cambridge to a new campus across the Charles River in Allston. A $1 billion science complex, which will house a stem cell institute, will stay on track for a ground-breaking early next year. But everything else, including plans for building four undergraduate dorms in the Boston neighborhood, will be reviewed, Faust said in a phone interview Monday. Aside from the extremely-inaccurate Globe graphic accompanying the story -- which was vastly incorrect on Harvard's land ownership in Allston, as well as missing at least one property (former Mahoney's) in Cambridge -- and the mis-statement by the reporter about "moving all or part of the ... School of Public Health across the river" (it's already in Boston's Longwood area, so it would stay on this side of the river), the story seemed reasonably reported, albeit not too Earth-shattering. I read the story to say that Faust and company are carefully revisiting most or all of the details in their overall plans, using a more deliberative approach. In fact, it was a nice story, pointing out how it sounds like Faust will be consensus-building, as opposed her strong-willed predecessor who appeared to many people to have decided everything in advance. The Globe story, however, at no time stated that this was a "change of course" or a "reversal," hence Faust appears to be the only one making a misrepresentation. Maybe Faust should apologize to the Globe for misrepresenting their story? [Faust] said the university will take pains to consult more widely and deliberately with faculty and community members and, if necessary, revise the plan before giving the final version to the city next fall. which doesn't sound like a "change of course" or a "reversal." Harvard's decision to delay the building of the museum in Allston and instead first renovate the Fogg and Busch-Reisinger museums in Cambridge was part of Faust's desire to slow the process and review the overall Allston plan, said Steven Hyman, provost. Now we see that Hyman is actually the one claiming that the process is being slowed down and reviewed! Note that neither Faust nor Hyman have yet expressed that they have been misquoted, although both were only quoted indirectly, so they appear to stand by their statements. Is Faust, by saying that the story "seriously misrepresents what we're up to," instead trying to debunk the story's premise that she will be consulting more widely than former president Lawrence Summers in planning for Allston? I hope not, because the story read to me like good PR by Harvard, not bad reporting by the Globe. Faust's talk on WBZ, on the other hand, looks like awful PR. Maybe, instead, Faust just didn't read the story very carefully. Details matter. EDIT: Harry Mattison has a full statement from Faust on his blog. FAUST: Let me just say that Allston is an enormous priority for us. It's moving along very well. The story in the [Boston] Globe today seriously misrepresents what we're up to. What I tried to say to the reporter is that we are now in a kind of phase two, which is a natural evolution. We have had the ground-breaking for the first science building. We are now involved in detailed planning for two professional schools that are contemplating moves. That means that we are developing their academic plans as a basis for developing physical plans -- that's the appropriate next step, and that's the step that we're pursuing. And we also are preparing to file our revised master plan with the city, probably in the fall. As you may know, the Allston science building was built with special permission that made it possible fo us to do that before we receive the overall approvals. And so now, we're taking the appropriate step which is to go ahead and do that. There's no way in which we're slowing down. We're just pursuing a thoughtful, deliberative process that has many stages, as this will take many years, and we're in a stage that is the right stage to be in. So, for it to be represented as a change of course or a reversal is simply a misrepresentation. LAWLER: Harvard does need to expand, and this process you talk about as deliberative and doing things in their certain order, does that process include input from teachers, and professors, and students? FAUST: Oh, of couse, yes. I referred to the Public Health School and the [Graduate] School of Ed[ucation], and their planning process which is involving faculty, students, staff from across those schools, that's how one develops an academic plan, and an academic plan is how one builds buildings and decides what it should be like. In the case of the science building, we have broken ground. We have identified the groups of faculty that are going to occupy that building, and they are involved in planning the spaces that they will be using within that building. So, yes, on every level. Bus Route That Just Won't Stop: Bus #65 starts in Kenmore Square, travels through Longwood and Brookline Village, and has its terminus in Brighton Center... so I am surprised to see BC's map having it continue west beyond Brighton Center towards Oak Square. Magically Re-Routed Bus: Bus #66 starts from Harvard Square and travels roughly south through North Allston and Allston -- not southwest into Brighton, through Brighton Center, and towards Oak Square. They have magically moved the Bus #66 route a mile-and-a-half to the west. Another Re-Routed Bus: Bus #57 goes east-west through Brighton, but does not branch south along Chestnut Hill Avenue. Having so many buses appear to pass near to BC's campus sure does make it look like the university's neighborhood is exceptionally well-served by public transit. The funny thing is that Harvard's North Allston neighbors have been clamoring for improvements to Bus #66 service. Boston College has offered up such improvement by extending its route out to Oak Square! If only photoshop = reality. UPDATE (12/28/07): BC's IMP website has updated this figure, correcting the mistakes noted above (while classifying route #52 with an asterisk for "limited service"). One reader noted that route #193 may refer to a once-a-day afternoon run of bus #57 along a slightly different route. Last night, Boston College announced their new institutional master plan, and today they filed it with the city of Boston. Strategic Plan website, "Towers of Excellence"
Boston Globe: "Grand expansion at BC: $1.6b plan calls for faculty increase, massive construction"
Boston Herald: "Eagles let fly $1.6B plan: BC to grow out, add 100 profs"
BC's The Heights (student newspaper): "BC unveils $1.6 billion strategic plan"
Associated Press: "Boston College Seeks $1.6B Expansion"
"There will be extensive construction on campus for at least the next seven to 10 years," Leahy said. He added the college would stagger construction and would borrow substantially to finance the project, but would not tap its $1.7 billion endowment or raise tuition beyond normal increases. To support the initiative, President William Leahy said BC is eyeing what will likely be its largest capital campaign ever. The college will likely have to raise as much as $1 billion to make the expansion possible. BC’s largest fund-raising campaign to date netted $440 million and ended in 2003. Meetings with the [BC] Task Force have been a source of debate between the University and the local residents, who have expressed their concerns with bringing students closer to an otherwise quiet neighborhood. "We know there will be concerns on this development on this space which has been like a park for the neighborhood, and we have been meeting with them for a year and a half and have made necessary changes to the plan," Leahy said. Those changes include moving student housing farther away from Lake Street, which will use the natural barrier of the surrounding trees and gradient change to keep students and noise insulated within campus. Boston College's just-released 10-year master plan continues to include a proposal to build undergraduate dormitories on their Brighton Campus, i.e., the former St. John's Seminary land purchased by BC in 2004-2007. One of the buildings has been moved a few hundred feet away, and the combined number of beds was reduced from 600 to 500, but the current proposal is mostly similar to that proposed earlier in the year. "I am disappointed that Boston College went down this road, especially after they promised the community that they would not be putting any undergraduate dormitories on that side of Comm Ave. I think they should pull back and re-evaluate. If they are hoping to gain community support for other things in their master plan, it will be very difficult to gain support for their many other projects if they started off with not telling the community the truth. The notion of building UG dorms on this side of Comm Ave is something I do not support." "I don't support that [undergraduate dorms] on the St. John's Seminary, no I don't support that. An opportunity exists for BC to build more housing on their Chestnut Hill campus. There is no longer an opposition to them building dense[ly] on their Main Campus. The community feels that they would rather see BC build on their Main Campus. Use the land over at St. John's for administrative offices and academic purposes." During the campaign for the District 9 City Council seat, Councilor-elect Mark Ciommo repeatedly expressed his opposition to the dorms. Senator Steve Tolman, when asked Tuesday for his position on the Brighton Dorms, was more circumspect, saying that he has not yet formed an opinion. As for the master plan, in general, that BC just released, Senator Tolman said, "I think it's a good first step. They're doing it straight... I don't think there's any problem that can't be worked out." Mayor Thomas Menino has not expressed an opinion on the Brighton Dorms proposal, but has historically favored increased on-campus housing for Boston's universities and colleges. Reverend William Leahy, S.J., President of Boston College, said that "the Mayor hasn't given his seal of approval on each individual proposal, but the [overall master plan] concept is favorable to him because he likes having students on campus..."
Outgoing Councilor-At-Large Felix Arroyo, and his replacement, Councilor-Elect John Connolly, both oppose the Brighton Dorms. Other Councilors-At-Large either did not respond to the questionnaire (Councilor Stephen Murphy) or did not give clear answers for or against the proposal (Councilors Sam Yoon and Michael Flaherty). 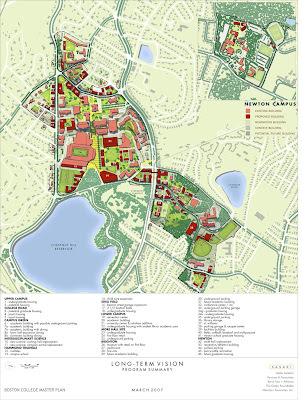 At Tuesday night's meeting of the BC Task Force, Boston College unveiled their 10-year institutional master plan that they plan to file with the city of Boston on Wednesday. Their filing will initiate the Article 80 review process for their IMP. Information provided at the meeting by John Fitzgerald of the BRA indicates that there will also be one or more "large project reviews" concurrent with the review of the IMP. Undergraduate dormitories are still proposed to be built on the "Brighton Campus" -- the former St. John's Seminary land bought by BC between 2004 and 2007 -- but are now proposed to be 500 beds instead of the previous 600. More Hall Dorms (undergraduate) have been proposed at 420 instead of the range 350-460 beds. The total number of undergraduate beds added is down to 610 from 640. Athletic facilities (baseball stadium, softball stadium, and two multipurpose fields) are still proposed for the north end of the Brighton Campus site, but one multipurpose field has been moved out of the baseball outfield to be a separate field located at the currently-fenced parking lot. The support building (e.g., batting cages, lockers, tennis courts, indoor track) will now be underground -- underneath the multipurpose fields adjacent to Bishop Peterson Hall. The baseball stadium is now proposed to be 1500 instead of 2000 seats. The multipurpose field closest to Lake Street is now proposed to be natural turf, while the other three fields are still proposed to continue to be artificial turf. The housing proposed for the Foster Urban Wild (188-196 Foster Street) is back down to a 70 bed facility; it had been recently described as 90 beds, but was originally described as 70. Its usage was described now as "graduate student / faculty" housing instead of the previous "graduate student / seminarian." The Brighton Fields Parking Garage has been moved further away from Lane Park houses, no longer has tennis courts on top (I believe they were mentioned once to be part of the underground support building), and have been increased to 500 from 200 spaces. BC is proposing to restrict their undergraduates from living off-campus in one- or two-family houses, but still allow them to live off-campus in three-family or larger structures (such as 2000 Commwealth Avenue); this idea had been floated privately to many residents since the spring. A BC employee mortgage assistance program is proposed to help BC staff purchase houses in Allston-Brighton. BC's viewgraph stated that the MBTA's preferred option for locating the BC B-line station is the site in the center of Commonwealth Avenue; the MBTA has not previously spoken either way to the community. Most of these are small or subtle changes to the previous plan which don't change its broad outlines or themes. I don't have an electronic copy of their presentation or their IMPNF, so some of the above descriptions might be vague or confusing to the casual reader. BC's presentation at the meeting, as well as their regulatory filing documents, are likely to be posted at their website in the next few days. The Boston Globe will likely run a lead story in Wednesday morning's newspaper which, based on their previous coverage, will probably have an accompanying graphic in color. What in the Plan is Unchanged? Undergraduate dormitories still located on the former St. John's Seminary land, despite repeated opposition from Brighton neighbors throughout the year. Baseball stadium still located close to Lane Park houses, softball stadium next to it, two multipurpose fields, all fully lighted for (presumably) regular nighttime use, etc. Edmonds Hall, with 790 beds of undergraduate housing, is still proposed to be demolished to make way for a Recreation Center. BC still proposes to move St. Thomas More Road further east where it intersects with Commonwealth Avenue. Shea Field Dorms still reach the eastern-most part of the parcel, directly across the street from the Chestnut Hill Reservoir. Housing still proposed for the Foster Urban Wilds abutting Orthodox Jewish community on Portina Road, including demolishing the three houses currently on one corner of the site. How Did the Community Respond? Most of the responses from members of the task force and the community were about BC's plan for undergraduate housing: arguing strongly for BC to increase the number of on-campus undergraduate beds in their master plan, opposing undergraduate dorms altogether on the Brighton Campus, and questioning how BC balanced the need for dorms with their desire for open space in the form of internal courtyards. Getting More Students Onto Campus. Task force member Kevin Carragee detailed how BC could house all their students on-campus with dense (tall) building at the MODS and RecPlex sites. "I don't understand why it can't be exploited for more housing," he said. "I don't see why [it's] only four stories." Many comments repeated desire for 5-6 (or even 7-8) story dormitories on the Main Campus as the preferred solution for how to move all the remaining students back onto campus. "I don't understand why the MODS [replacement] can't be six stories," said task force member Tim Schofield. Thomas Keady, Jr., Vice President of Governmental and Community Relations at Boston College, objected to any building taller than four stories based on BC's ideas of student formation issues. "We have done our best to house our students," he said. "BC is never going to house 100%" of the students on-campus, because some of the students are commuters. "We are opposed to seven-to-eight story buildings," said Keady. Schofield countered that "it seems selfish to us" that BC opposes taller dormitories on the Main Campus. How many students commute, i.e., live with their parents and commute daily? I heard the words "around 100" come from the vicinity of two BC officials, while one of them simultaneously nodded his head. That means BC's plan leaves another 590 students living off-campus in the neighborhood. "We can, with the BRA's help, find room for 600 more beds on that [main] campus," continued Carragee. Opposition to Brighton Dorms on the Former St. John's Seminary Land. Many of the comments from the audience expressed continued opposition to the proposal to build undergraduate housing on the Brighton Campus. "We've told you, for months, that we don't want it," said Alex Selvig. One resident gave a more measured response. Shelby Marshall said that "if the students are not in the neieghborhood, [then] I don't have a philosophical issue" with undergraduate dorms on the Brighton Campus. Since BC's proposal leaves 590 non-commuter students living off-campus, Marshall's condition appears not to have been met by BC's proposed master plan. The Brighton Dorms were originally proposed along the spine road next to the Gymnasium, but the 10-year plan puts one dorm closer to Lake Street -- right next to the existing library and in the direct line-of-sight for Lake Street residents. BC officials thought only the roof of the four-story dorm would be visible from Lake Street, but several residents said that they can already see nearly the entire side of the two-story library. As best I could tell, BC officials were checking out the line-of-sight only to Secretary Galvin's house, not to Selvig's and Pizzo's further down the street. One resident told me after the meeting that, with their siting of one undergraduate dormitory further away from Lane Park but closer to Lake Street, he felt BC was pitting one street against the other in order to divide the neighborhood. Public Versus Private Open Space. Other comments at the meeting expressed dissatisfaction with the process by which BC is taking open space away from more public areas in order to have more private, inner courtyards in their quadrangles. Alderman Lisle Baker of Ward 7 in Newton pointed out that BC's plan "maximizes internal open space," but that it also "needs to respect open space of public areas" adjacent to public roads, parks, etc. Similar criticism was levelled against Harvard's science complex. Backfilling Students Into Neighborhood Apartments. Senator Steve Tolman expressed his concern that, if more BC students are moved back onto campus, then students from other colleges and universities around Boston will "backfill" into the newly-vacant Brighton apartments. He pointed out -- which repeats comments that Councilor Jerry McDermott has made earlier in the year -- that this appears to be what happened in the neighborhoods near to Boston University. He argued that the problem needed to be addressed as part of the overall master plan. In an obvious screw-up, the BRA and BC scheduled this meeting to present their new master plan on the first night of Hanukkah. BC and BRA officials are regular readers (and posters) to the "BC_Neighbors_Forum" google group, where Alex Selvig noted on November 13th that the December 4th meeting would conflict with Hanukkah; on the same day I wrote another email to John Fitzgerald and Gerald Autler, project managers at the BRA, notifying them of the same. They appear to have ignored issues raised about the date of the meeting. Keady opened Tuesday's BC Task Force meeting noting the scheduling conflict with Hannukah. He noted that they had met with the Civic Jewish Community on November 14th (as I had also noted here), and that he had (apparently quite recently) scheduled another meeting with the Orthodox community at Shaloh House on December 18th. While stating he wasn't Jewish, Keady said that he understood that while Hanukkah (or it's first night) might be a holiday, it isn't a "Holy Day" (e.g., see stories such as this one). Rabbi Dan Rodkin of Shaloh House nonetheless showed up at Tuesday night's BC Task Force meeting about a half-hour into the proceedings. He noted that he couldn't stay long because his kids were waiting for him, and said that "our community is very insulted" by scheduling the BC task force meeting that night. "We would like to be here and hear what you have to say," he continued. "This is very wrong." Keady stated again that they had an agreement for a meeting on the 18th, and Rabbi Rodkin left to carry on his celebrations. The task force later decided that they would also attend the Shaloh House meeting on December 18th as an official meeting of their group. The task force made the right move after the blunder by BC and the BRA. Boston College was recently listed as having a $1.75 billion endowment, but their "strategic plan" calls for $1.6 billion in capital expenditures, according to BC's student newspaper, The Heights. BC recently obtained $177 million in tax-exempt bonds, which brought their current, total debt up to $630 million, according to The Heights. I don't think they've maxed out their credit cards yet, but having a master plan's capital expenses, when combined with existing debt, that substantially exceeds the size of their endowment seems rather optimistic. The BRA, Task Force, and the Boston Zoning Commission will review the proposal and send their respective recommendations to Menino, who has the ultimate authority to approve or deny the proposal. EDIT (7:00 am): The Boston Globe's front-page article, "Grand Expansion at BC," can be found here. Want to claim your personal exemption on your 2007 Massachusetts state income tax form? If so, you need to satisfy the state that you've either got health coverage or that you looked and was unaffordable, otherwise you lose the exemption that is worth $219. (Note: I'm no CPA.) Employers of more than ten employees also have to show that they offer coverage, or else pay a nominal fee instead. Mark Ciommo, District 9 City Councilor-elect, was a no-show at the City Councilors (and candidates) talent show October 26th in Hyde Park. Did he dodge the event because he can't carry a tune? One report from last night's tree lighting in Brighton Center said that he, in fact, has quite a voice when he's Christmas carroling. Rosie Hanlon, Executive Director of Brighton Main Streets (which sponsored the event), managed to get him up front of the crowd, but he apparently woudn't take the microphone to lead the singing. Maybe he's just shy. Next time: setup a shower curtain. The City Council needs a crooner to replace outgoing Councilor-At-Large Felix Arroyo. The Department of Conservation and Recreation has been working on a plan to renovate the Chestnut Hill Reservoir. They will present the final design for rework on the pathways -- which should improve drainage as well as access for the disabled -- at a public meeting this Thursday. Around 10:30am on Friday, the victim alerted officers at the front desk of District 14 that her ATM credit card had been stolen and all her savings spent. This was particularly disturbing to officers because the victim is 82 years old and legally blind and had to be assisted by a friend to come to the station. A district detective was notified regarding this incident and later met with the victim and her friend. The victim reported that her ATM credit card had been used at two different locations nearly depleting all the funds that she had in the bank. Officers subsequently learned of a theft of a credit card that had been captured on close circuit TV by Loss Prevention at the AJ Wright Store located at 60 Everett St. in Brighton and responded there to view the video. There, officers viewed a video of the victim making a purchase and suspect, Smith failing to return her card to her and later passing it off to suspect, King. Officers then responded to the locations that the victim’s card had been used and saw video of suspect, King making purchases using victim’s ATM card. Based on the information attained, officers then returned to AJ Wright store and in cooperation with store Loss Prevention personnel found out what time suspect, Smith was getting out of work, and also learned that suspect, King usually picked her up. At approximately 10:40pm, officers placed both suspects under arrest when for the above noted charges when suspect arrived at the store to pick up suspect, Smith. One of the suspects allegedly bought groceries, then a pair of sneakers -- and then the sneakers were stolen from him. EDIT (12/4/07): The Boston Globe ran the story on the front of their City/Region section. Arniya Smith, he AJ Wright employee -- former employee now -- who allegedly lifted the debit card apparently has several outstanding warrants and is being held on $10,000 bail. No word on why TJX, who owns AJ Wright, would hire someone with outstanding warrants and then put the person at the register. The Boston Parks and Recreation Department has published their draft open space plan for 2008-2012. Current work in 2007 is in some kind of purgatory between the previous 2002-2006 plan and the proposed next one. I must say that I heard nothing about the fact that they had actually published a draft plan until I read yesterday's short article in the Boston Globe's City Weekly section. Failure to get the word out would explain why Mary Hines, spokeswoman for Mayor Thomas Menino, said that the city has received few public comments to date. The department wants feedback on their plan, which you can submit until December 9th (this Sunday) using the online form. "Rogers Park is the sixteenth most often used park in the city of Boston, second most used in Allston-Brighton and received the lowest funding from capital projects spending from 2001-2006, considerably lower than any other park in Allston-Brighton." The Parks Department's open space is the place to address such disparities so that significant capital expenditures can be targeted where they are most needed. but have not gone into detail about the specific elements of the 10-year IMP. The 10-year IMP is the one that will be filed with the BRA and be the subject of the formal regulatory process. BC Rolling Out IMP on First Night of Hanukkah. Yes, Tuesday's meeting of the BC Task Force will take place on the first night of Hanukkah, despite concerns raised by at least a few members of the community (including myself). In September, Harvard University showed deference to a Jewish holiday by rescheduling their first night football game, but no such luck here: secular BRA and Jesuit BC have stuck to their Hannukah meeting schedule. Maybe at the meeting we'll find out about the schedule put together by BC and the BRA for future BC Task Force meetings, such as on Christmas Eve, New Year's Day morning, Good Friday, and nightly during Ramadan. (Scheduling conflicts with December 28th, however, would no doubt prevent that date from being used.) So... who's bringing the menorah and dreidels along on Tuesday night? Will the 10-Year IMP Show Any Modifications From Previous Plans? Since May 2007, BC officials have given no public indication of what elements of the IMP, if any, have been modified in response to the community's comments. Even the Boston Globe editorial page showed some concern, since they referred to BC's expansion into the former seminary land as being "Too Close for Comfort"! 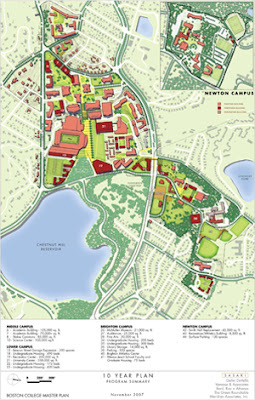 On Tuesday, it should be immediately clear whether or not BC has responded to concerns raised repeatedly by the community during 2007: student housing, i.e., Brighton Dorms vs. Main Campus; athletic fields, particularly the 2000-seat baseball stadium; Foster Rock housing abutting Orthodox Jewish community on Portina Road; and re-routing St. Thomas More Road. Brighton Dorms. The most obvious indication of whether or not BC has responded to the community's concerns is to see if the "Brighton Dorms" (on the former St. John's Seminary land) are anywhere to be found on the 10-year IMP. The community has expressed pretty much unanimous opposition to constructing undergraduate dormitories in the former St. John's Seminary land -- as did all candidates for the District 9 City Council seat (including Councilor-elect Mark Ciommo), Councilor-At-Large-elect John Connolly, and many elected officials (including State Representatives Kevin Honan and Michael Moran, who told me of their opposition earlier in the summer). The community has repeatedly suggested building densely on BC's Main Campus instead, in locations such as the MODS site, as well as not tearing down Edmonds Hall. If the Brighton Dorms appear in the 10-year IMP, there will be little doubt that BC has ignored the community's concerns voiced repeatedly throughout the year. Nonetheless, if I were in Deval Patrick's Suffolk Downs Casino Royale, I would bet that the Brighton Dorms are still part of the IMP that BC will file -- because outside contractors were seen in October boring soil samples where BC wants to put the undergraduate dorms and parking garage. Another indication that BC is not accomodating the neighborhood is a page on their IMP website (updated 11/20/07). If BC's presentation of their IMP on Tuesday shows the Brighton Dorms anywhere, I wouldn't be surprised to see a crowd at least as raucous as the BAIA and BC Task Force meetings in May. On the other hand, if BC's IMP includes dense housing construction on the MODS site, then this would be an indication that BC has been sensitive to the community's concerns. Such a modification to their IMP would eliminate the need for the Brighton Dorms as well as move more off-campus students into campus housing. Foster Rock Housing. The IMP is expected to include construction of 70-90 beds of graduate student / seminarian housing at 188-196 Foster Street next to the Foster Rock, a parcel that directly abuts a large Orthodox Jewish community on Portina Road. BC officials met last week with members of that community at Shaloh House, and all indications are that this housing proposal will continue to be part of the IMP, despite the concerns raised by the Orthodox community all year (and at last week's meeting). Due to their observance of Hannukah, it is unlikely that any members of the Orthodox community will attend Tuesday's meeting, according to one member of the congregation I contacted. One particularly ill-conceived element of BC's earlier proposal was the plan to tear down three houses (dating from the 1880s) at the corner of the combined parcel -- at 188, 192, and 196 Foster Street. Harvard University, on the other hand, found a straight-forward way to build around existing houses -- thereby preventing their demolition -- when they built the University Place development in the early 1980s in Harvard Square. Can BC show that they now want to help keep families in the neighborhood by keeping and/or renovating these three houses, like they've done on Wade Street? Or will they have ignored community input by leaving the proposed housing the same as it was earlier in the year? The wrecking-ball answer may already be in hand: at recent meetings BC officials have noted that they have upped the size of the facility from 70 beds to 90. Baseball Stadium. Many members of the community, particularly residents of Lane Park, have expressed strong concerns (e.g., the lights, noise, traffic, etc.) about BC's proposed 2000-seat baseball stadium for the fields at the north end of the Brighton Campus. While only around 20 home baseball games (many nighttime) are expected each spring, BC wants to use the "multipurpose" field in the baseball stadium's outfield -- as well as another multipurpose field nearby -- with full field lights nightly throughout the year. BC also has proposed to install artificial field turf for the baseball stadium, softball stadium, and multipurpose field, despite concerns the about the polycyclic aromatic hydrocarbon contamination (stemming from recycled tires in the rubber layer) that could adversely impact the local ecosystem and nearby Chandler Pond. Inspection of the IMP's proposed lighting, nighttime usage, and type of turf for the athletic fields will be a direct indication of whether or not BC has responded to legitimate concerns raised by the neighborhood. Re-routing St. Thomas More Road. Rather than have a public street pass in-between BC's Main Campus and their More Hall parcel, BC has proposed to re-route St. Thomas More Road to pass between More Hall and the Evergreen Cemetery. Additionally, BC wants to move the MBTA B line "BC Station" from its current location back a couple of hundred feet to the middle of Commonwealth Avenue. In their new IMP, look to the re-configuration of St. Thomas More Drive, the new intersection, and the location of the MBTA station to see if BC has learned anything from the neighborhood's skepticism -- if not outright negative response -- or if they are just barreling ahead on all cylinders. *** EDIT (12/3/07): BC's student newspaper, The Heights, reports that the master plan "be announced publicly on Wednesday when it will be formally filed with the city." The Brighton High School Bengals went 12-0 for the season by beating West Bridgewater 16-8 in the Division 4 Super Bowl Saturday. The Boston Herald has the play-by-play. Dan Shaughnessy has a nice story in the Boston Globe about the kids who practice not on campus, but have to take the T to Cleveland Circle's Cassidy Field / Playground. I feel sorry for everyone who has to share a bus or subway car with the sweaty team following their practices, since they have no place at Cassidy to shower. You would think the DCR could make an arrangement for them across the street at the Reilly Memorial Rink and pool. U. S. News and World Report announces it's list of the top 100 public high schools in the country, giving each a gold medal. Not surprisingly, Boston Latin School comes in 19th place. Media and Technology Charter High School took 99th place. Here in Brighton, three schools were among the 1,086 awarded bronze medals: Another Course to College and Boston Community Leadership Academy, both pilot schools occupying part of the former Taft Middle School's building, and Brighton High School across the street. Via the Boston Public School's "All About BPS" blog. Information about the Allston-Brighton District 9 City Councilor 2009 race can be found here. What do you think was the biggest reason for the low voter turnout in the November 6th election? Blog contents copyright © 2007-2010 by Michael Pahre. All rights reserved.